I had a really bad dream two nights ago, more like a nightmare. I was riding the subway, I had no iPad, iPod, Kindle, book, magazine or even newspaper with me and I sat across from a woman who kept staring at me. I didn’t want to make eye contact, so I kept looking at the floor. But for some reason (dreams are always weird) I was eventually forced to meet her eyes and she started talking to me. We had like the most weird conversation ever, which seemed to never end. Let me tell you, I woke up drenched in sweat and scared as hell. I mean, engaging in friendly chit-chat on public transportation? That’s something we just don’t do around here. I’m sorry, we’re from the City, we are not trusting people! Okay, okay...I’m exaggerating a tad, but I honestly don’t think I ever said anything, let alone had a conversation to anyone on the subway (who wasn't a friend/acquaintance). Another nightmare I often have is walking into the kitchen to see my fridge completely empty. Just like that, no food or drinks. Scary. Sadly that nightmare became reality yesterday. I opened the fridge’s door and found only two cans of coconut milk. No veggies, fruits, eggs or meat. None, nada, zero. But I'm a resourceful person. I can pretty much think or act my way out of any problem to make the outcome favorable. 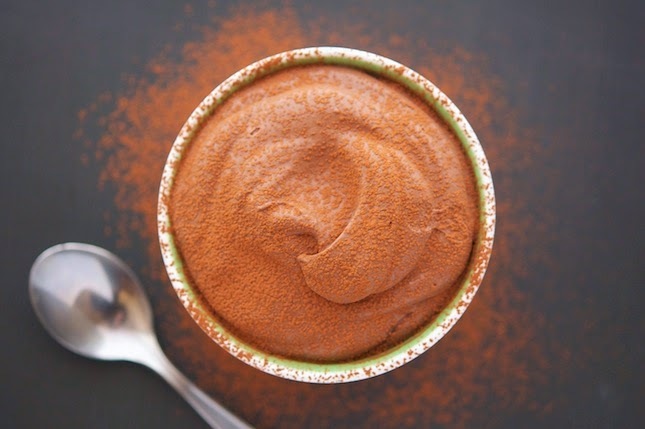 And that’s how this 3-Ingredient (Dairy-Free) Cocoa Mousse came to life. Coconut cream, cocoa and honey (or maple syrup). It doesn’t really get much easier than this. 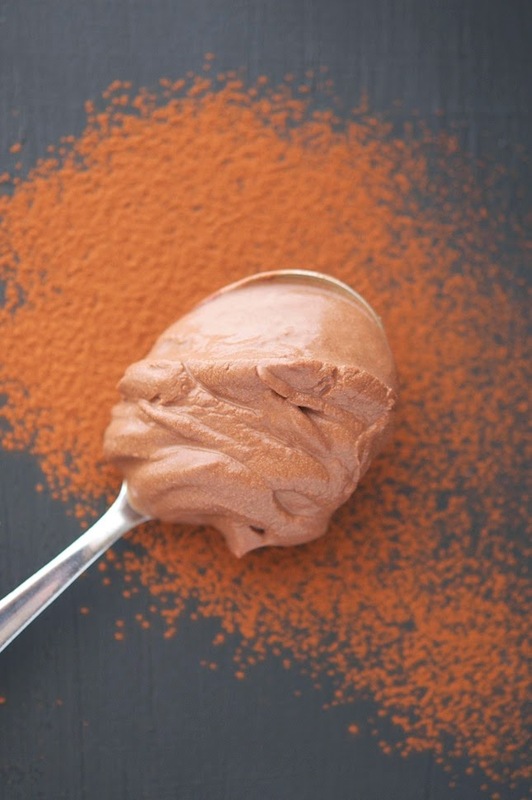 Chocolate mousses traditionally range from dense and thick to light, air and whipped. They can be made with heavy cream, avocado, bananas, chia seeds, etc. The are all equally awesome in my book. This particular one is pretty thick, but airy and light at the same time. It’s great by itself, but also wonderful for frosting a paleo cake, as a fruit dip or for filling tarts. It tastes a bit of coconut, but the cocoa/chocolate flavor is pretty intense. Eat this and I can guarantee you, no nightmares! 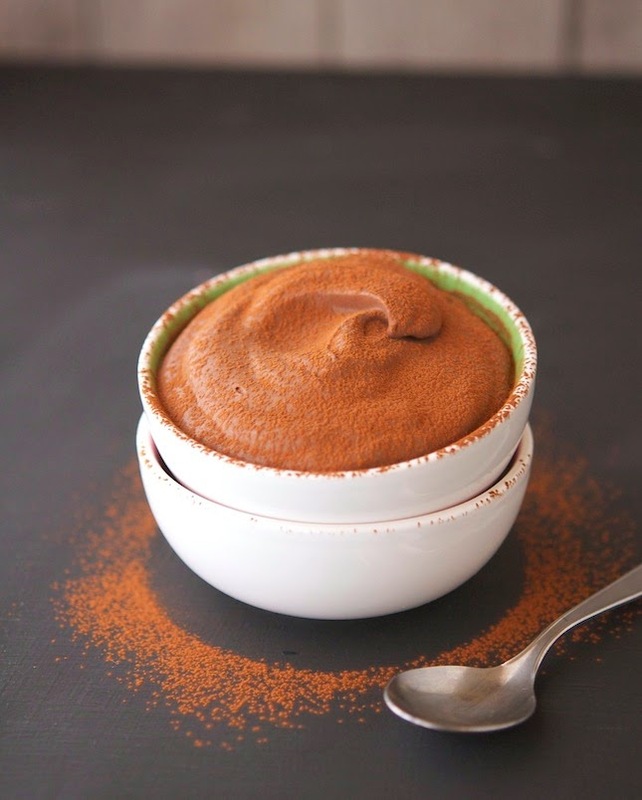 Because this mousse is vegan, paleo, refined-sugar free, dairy-free and so very good for you. It has been said that after eating you might even experience nirvana. 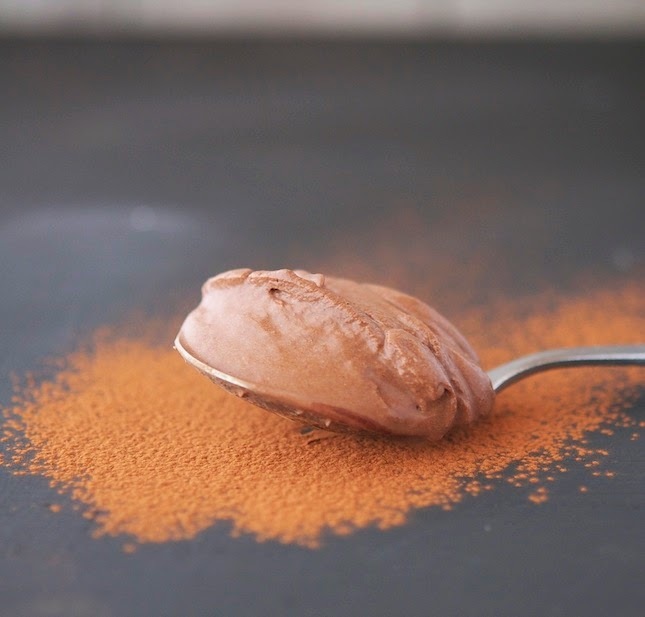 3-Ingredient (Dairy-Free) Cocoa Mousse Print this recipe! For the coconut cream, refrigerate the cans of coconut milk overnight, (several days if possible) then scoop out the cream that rises to the top and reserve the liquid for other uses. Add cocoa, honey and vanilla extract (if using) to the bowl and beat, starting on low, increasing incrementally to medium speed until soft peaks become visible, about 5 minutes. Divide the mixture evenly among ramekins and refrigerate until ready to serve. Mousse will become thicker as it chills in the fridge. One serving yields 243 calories, 19 grams of fat, 21 grams of carbs and 3 grams of protein. This looks really good Mike I now keep 1 can of coconut milk in the fridge, will make it 2 but can you over mix this like whip cream? Happy week-end to you! No Cheri, there's no risk at all to over whip coconut cream. At least it has never happened to me! Yum! I will definitely be giving this a go! Awesome Laura, lemme know how you like it! Mike! I love how easy this is...and your photography is totally amazing. I want to lick it off of my screen. And I recommend spending a couple weeks down South. Pick a classic city like Charleston or Nashville. Then when you come back to NYC, you'll be chatting it up with every stranger you can find. "Howdy, y'all!" I so want to live down South for a couple of months, master the accent and become super friendly. We definitely need more South warmth here in the City! Damn this Easter weekend, too late to shop now! I'm so going to prepare this! Easy , light and yummy - it can't get much better. Cool post Mike, made me smile when reading about your nightmares. Glad you enjoyed Daniela, it's always a pleasure hearing from you! I have to agree with David - Mike your photos are fantastic! Also fantastic is this mousse! I love coconut cream and I can imagine this mousse is pretty darn close to nirvana alright! Is this even real??? Oh wow, it sounds like the best thing that ever happened to healthy desserts - I love this! This cocoa mousse looks divine! These beautiful photos make me wanna grab that spoon! I'm always amazed when I travel in the South by how friendly people are there. We need to learn from you guys! Dude this mousse is incredible. I actually think I have a couple cans of coconut cream in my pantry... gonna let them hang out in the fridge when I get home so I can try this in the upcoming days. Looking good, Alpha, looking good.. Thanks Amelia, you're always super nice! Mike, this is an awesome recipe/photos, thanks for sharing. Hey Maria, it's about 1 cup of coconut cream! So good! And easy, that's how I like it! Thanks! I love this idea as I am lactose intollerant and kicking the sugar habit. I made it up and may have used a tad too much coconut cream as the flavour is very strong. I'm not too keen on the coconut flavour but am re-tuning my taste buds to correct that. Other than that, it actually turned out really well and crazy simple. Despite everything it was really really amazing and topped off with a few raspberries made it to die for! !